Hannah is one of the women in the Bible who was not able to bear a child until she reached old age. Each year, Hannah goes to the sanctuary to plead with the Lord. Because this desire for a child is not satisfied, her shame torments her. She is “sorely troubled,” “deeply distressed,” “weeping bitterly,” and “her heart is sad.” We can look at Hannah’s despair and the powerlessness of her husband, who responds: “Am I not more to you than ten sons?” He also would like to satisfy her, but it is impossible because she is awaiting someone else, and the conjugal bond is not enough to fulfill her. Waiting for a child implies a couple — a man and a woman. This desire lives in both the man and the woman, even if we do not know how to express it in the same way and at the same time. Seeing Hannah’s sadness also afflicts her husband, who would very much like to make her happy. Hannah finds peace again. She goes away and agrees to eat and to get back to living. She does not yet know that she is going to conceive; nonetheless, she does not feel sad, as she did before. The prayer and the exchange with Eli, which is first turbulent and then filled with compassion, changes her heart. She can peacefully go back to her family. Her face changes, even though the circumstances are apparently the same. During this time, we can also meditate on the story of Elizabeth, the mother of John the Baptist (Luke 1:5–25). It is quite similar to Hannah’s. It is also like the story of Abraham and Sarah, when the angel tells Sarah that she will have a son in her old age (Gen. 18:1–15). We can meditate on Sarah’s disbelief and on the fulfillment of God’s promise to this couple, which is beyond anything that is humanly possible. Let us look at the desire that is in the hearts of these women. Yes, Lord, You understand the desires of my heart. You know the desire that is in me, that is in us — to be able to receive and welcome a child in myself. May he be Your gift. I entrust all my joys and sorrows and hopes to You — like Hannah, who was not afraid to show her despair in the sanctuary. She knew that You would hear her prayer and that she could express it to You in the depths of her heart. Lord, give me hope while I’m waiting, and help me to pray to You with complete confidence. Amen. This article is from a chapter in Nine Months with God and Your Baby. It is available for the first time in English from Sophia Institute Press. Éline Landon is an author and a convert to the Catholic faith. 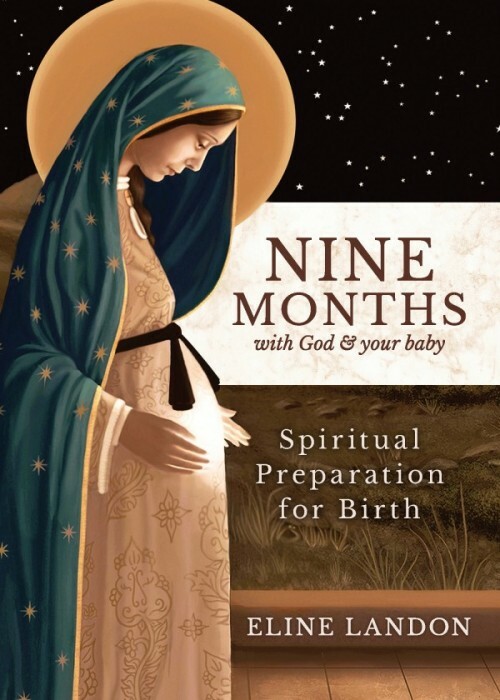 Her latest book, Nine Months with God and Your Baby, was originally published in French by Groupe Elidia.